9406 W Boynton Beach Blvd. Heading West on Boynton Beach Blvd. make a U-Turn at the first traffic light past Lyons Road. Make an immediate right turn into the first drive way. Chabad is located in the gray house straight ahead. 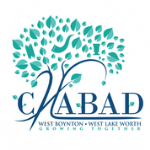 Chabad of West Boynton is a satellite of Chabad of Greater Boynton.